Meu Meu is my name — and love is my game! 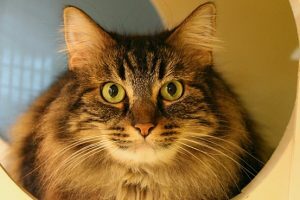 I’m a very talkative and affectionate 6-year-old gorgeous girl with medium-length luxurious fur and a big personality. I am still a very playful and energetic cat and I also love to watch the birds in the window and chirp at them. Did I mention I like conversation with people, too? I will happily meow at you for attention and will crawl into your lap when I’m in the mood. Though I’m a big fan of people, I’m not a big fan of other cats and will probably be happiest as an only kitty. 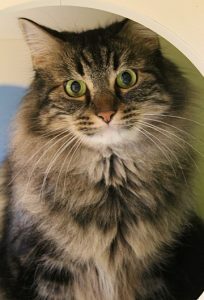 I’m a lot of cat personality packed in a little fluffy package, so you won’t miss having other cats around with me in your life! Are you interested in meeting a princess like me? Come down to Petco Unleashed on NW 23rd & Burnside and say hello! I come to you spayed, vaccinated, and micro-chipped for an adoption fee of $100.